For the first time since the New 52 relaunch last year, the classic Batman villain Two-Face will play a role in the narrative of the Batman family of comics, according to Batman writer Scott Snyder. Asked by a fan on Twitter whether Two-Face might show up anytime soon, the writer responded simply, "You'll see him in [the] Joker story." 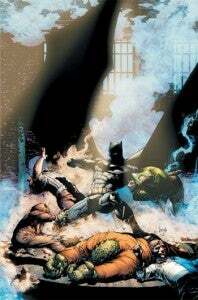 The story in question is the forthcoming Death of the Family, featuring The Joker's first appearance since it was revealed he had intentionally disfigured himself to alter his appearance in Detective Comics #1. The first images of The Joker's new visage have arrived online this week, much to the chagrin of Snyder's collaborator on Batman, artist Greg Capullo, who had hoped to keep the surprise alive until the comics went to press. The story, which runs between Batman #13 and Batman #17 and ties in with a number of the other Batman family titles, including Batgirl and Nightwing, will also feature The Penguin, who will appear in Batman backup features written by Snyder and drawn by Jock. It appears as though the decision to keep Harvey Dent in their pocket until this story has been in the cards since the beginning (although, as seen at right, he did appear on the cover of Batman #1).